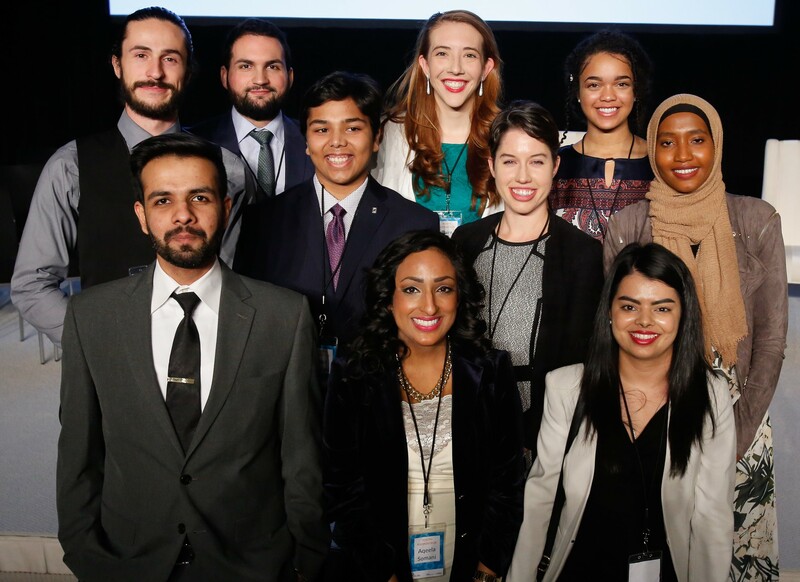 Global Pluralism Award rapporteurs are local youth and students who shadow Award recipients while in Ottawa and produce written and multi-media outputs that will contribute to the Centre’s public communications about the Award week. You can follow their work by searching #PluralismAward2017 on Twitter and Facebook. David Arteta recently moved to Canada from Spain, and since August has been part of the public affairs volunteering team at the GCP and the Delegation of the Ismaili Imamat in Ottawa. After graduating from Les Roches Hotel School in 2010 and driven by his passion for service, David has grown in his Hospitality career working in Belgium, China, U.A.E and England. On his different roles in Hotels, David has always aimed to make a difference for guests and colleagues. He looks constantly to be challenged and to step out of his comfort zone, and has the ability to bring people together towards common goals. Sharing his knowledge and developing others to success is another of his passions. Living in countries with such different cultures has enabled him to experience different lifestyles, broaden his perspective and embrace different ways of seeing things. After three years living in London, David decided to leave his job and travel with his girlfriend and brother around south-east Asia and Oceania looking for new experiences and memories to make. Shortly after moving to Ottawa, David was excited to share his time as a volunteer. During the time he spends at the GCP and AKFC David enjoys engaging with visitors, exchanging points of view and sharing experiences with them. David is very interested in Geo-politics and social development. He also enjoys cooking, adventure sports and traveling. I am a 25 year old Student studying in Communications. French is my mother tongue, but I learned English at an early age from exposure. I have 2 younger brothers with whom I am very close. I was raised in Gatineau, but I spent most of my teenage years in Mississauga, Ontario. When we were younger, my brothers and I would move often. From this experience, I always carry a desire to discover and live in new places. After high school, I moved out and worked in a small village on the St-Lawrence just shy of 11 thousand people for one year. I was 17 at the time and this was my entry into independence since I lived alone in a town where upon arrival I knew only one other resident. After that year, I moved to Montréal and went to school for a brief time. I ended up taking a break from school and finding to work until I was truly ready for it. I got a tremendous wealth of experience during my 2 years there. In the summer of 2013 I moved to Ottawa and started studying at uOttawa University. The things I am most passionate about are music and language. I love listening to music and discovering new artists daily. Although it has been a while since I sat down to practice, I very much enjoy playing music and composing as well. My second passion is language. I love working on my understanding and the intricacies of the languages I speak. The studies of linguistics is a discipline I would consider going back to school for. I have been learning German for the last 3 years and it is my hope that I will be able to use this language and any others I learn in my future career. My name is Mikaila Grace Boyd and I am a second year student studying International Development and Globalization with a minor in Environmental Studies. I have lived in Ottawa my entire life and love the city, especially the canal, its rivers, parks and downtown core. Although being a lifelong Ottawa resident has blessed me with many things, the most notable are fluency in French and a thorough repertoire of restaurant knowledge. Some of my hobbies include reading mystery books and painting with watercolors. I love to do yoga and spend time outside whenever possible. My passions are for art, recreational writing, and water and wildlife protection- especially sharks. Incidentally, I care deeply for water and its preservation. I’m a believer in the widespread potential impact photojournalism can have and in environmental and social justice fields. Magazines like National Geographic inspire me to explore photography and connect my love of nature to art. I am a firm supporter of the Black Lives Matter movement and of the rights of First Nation people. Additionally, I am involved in life on campus as the Vice President of Finance of the Developments’ Students Association and acting on Model United Nations Association. Lisa Hartman is a Canadian lawyer. Born in New York, she has lived in Montreal, Toronto, and Ottawa. She holds a BA in Political Science and Philosophy from McGill University and a JD from Osgoode Hall Law School. She loves thinking about how philosophy applies to everyday life. She will soon write for a blog called ‘Armchair Privacy’ – thinking about how philosophical ideas can help us understand distinctions between our private and public lives. She frequently volunteers for LGBTQ organizations, is an avid skier, and has a spirited miniature schnauzer. Malik moved to Ottawa, Canada from Karachi, Pakistan in December 2015. He studied Bachelor of Science in Electrical Engineering in Pakistan and pursued MEng. Management at the University of Ottawa. While studying, he co-founded a not-for-profit: Dextra, which aims to produce prosthesis for Syrian refugees in Lebanon. In addition to working at Dextra, Malik works as a Performance Marketing Specialist at Riaz Sidi Performance Marketing. Passionate about meeting new people and learning from them, volunteering in his Ismaili community was a natural move. Malik has volunteered as HR Director at Aga Khan Foundation – World Partnership Walk, Ottawa in June 2017. Currently, he serves as a teacher at the Ismaili community of Ottawa in addition to representing Young Ismaili Adults at Aga Khan Youth and Sports Board – Ottawa. As a newcomer, Malik received so much love from the amazing people of Canada that now he makes sure that new residents from diverse backgrounds get an opportunity to work together and create something extraordinary. In his free time, Malik loves to explore new places pinned randomly by him on Google maps. He passionately pursues urban photography as his hobby and maintains a portfolio of his experiments on Instagram. Fahma Khalif is currently in her last year at the University of Ottawa, majoring in International Development and Globalization with a minor in Social Science of Health. She has always been passionate about global issues, having witnessed and heard stories from family members about the many destructions caused by civil unrest and internal conflicts. Fahma was born in Nairobi, Kenya, and lived there during her first five years, her parents were Somali refugees that migrated to Kenya during the start of the Somali civil war. A keen believer in the idea that peace and freedom are constant struggles worth every fight and small victory, Fahma tries her best to volunteer and help local and marginalized communities. Having worked with and mentored marginalized youth, Fahma has a special interest in the positive impacts of community mobilization, and sees this as one of the best ways to fight and bring awareness to local and international injustices. In the future Fahma hopes to go back to Somalia and see it as the way her parents saw it, a diverse and blooming country that is not plagued by civil unrest. She also aspires to travel as much as possible and be more of global citizen. Moiz Lakhani is a grade 11 International Baccalaureate student. Currently, he is 2nd degree Black Belt in Jiu-Jitsu, Black Belt in Kickboxing, a 2x NAGA World Grappling Jiu-Jitsu Champion and 1x National Kickboxing Champion. Moiz has a profound love for giving back to his community and his work on the Sustainable Development Goals has been instrumental. This past summer he was invited to attend the United Nations Youth Assembly in New York, in which he met with key UN leaders, governmental officials, the IMF, World Bank officials, as well as, global organizations which will help him implement his work on the Sustainable Development Goals on a global scale. Moiz has also been selected as an ambassador for the United Nation Association of Canada and is a volunteer of Global Center for Pluralism and Delegation of Ismaili Imamat. Moiz is also a founder and CEO of an NGO called The Global Change Makers Group. The objective of the NGO is to implement and advocate Sustainable Development Goals 2030 in Canada and around the world. The NGO currently runs different local and global initiatives addressing Health, Quality Education, Gender Equality, Life on Land, Life below Water and global partnerships. On the occasion of Ontario 150, Moiz was also recognized by government of Ontario for his outstanding community work. Claire is a writer, social justice advocate, cultural explorer and global citizen. She’s always been fascinated by the concept of culture, and in particular, the idea of waking up in someone else’s shoes. This fascination inspired her to participate in a high school cultural exchange to Italy; a trip that opened her eyes and filled her with a passion for pluralism and anthropology. Upon completing her high school education, she chose to study International Development and Anthropology at the University of Ottawa. Unsatisfied with just sitting in lectures, Claire participated in a field research course to Senegal in 2016 to study the cultural role of education in rural Senegalese communities. Claire also participated in the University’s Model United Nations Course, in New York, March 2017. As the Swiss delegate for the Committee for Social Development (CSocD), she and her partner won the Outstanding Peer Delegate Awards. Claire is a former writer for Wingd.ca. Deeply involved in the platform during her stay, she wrote culture pieces and travel articles in French and English for two years. Some favourite articles include interviews with the authors of Goodnight Stories for Rebel Girls, celebrating her Franco-Ontarian Pride on September 25th, and an article commissioned by Extremely Together, What If We Told People That They Belong? She also wrote some interviews for Wingd’s book, An Insider’s Guide to Canada’s Capital. However, her fondest achievement with Wingd is co-founding and managing the #WingdSolve Campaign, an international problem-solving contest to encourage youth innovations and inventions in International Development. Currently in her final semester, she wants to pursue a Masters of Anthropology; specializing in mobility, diversity and discrimination. Nowadays, when she’s not studying feverishly to finish her degree, she works part time as a lifeguard, swims recreationally, dances salsa, and volunteers for the Canadian Educational Exchange Foundation (CEEF). Aanal Mehta is a senior undergraduate student completing her final semester of undergraduate studies in International Development and Globalization with a Minor in French as Second Language, at the University of Ottawa. She is passionate about helping create a positive change at the national and international level through grass-roots movements and effective policy-making, in areas of migration, access to education and issues pertaining to human rights and social justice. Aanal’s previous work experience includes working for various government departments such as Immigration, Refugees and Citizenship Canada and Public Services and Procurement Canada. She has also played an active role within her community, by volunteering at her local Member of Parliament’s office and being involved in non-profit organizations such as UNICEF and AIESEC. Moving forward, Aanal hopes to continue to engage herself with organizations and initiatives that challenge her and allow her to gain in-depth knowledge about aforementioned areas, enabling her to help create a positive change within the national and international community. With a user centric perspective, Aqeela Somani’s convictions lie in the intersection of technology, business development and international development. Aqeela is working towards her Master of Management, Entrepreneurship & Innovation at Smith School of Business at Queen’s University. Where she is focusing on change management, social impact investing and service design. In addition to her role as an Account Manager at the Chief Information Office Branch within the Treasury Board Secretariat, she continuously engages in innovative pilot programs to foster a better work environment. Aqeela’s passion for International Development leads her to volunteer for numerous events and discussions at The Global Centre for Pluralism and Aga Khan Foundation Canada. She is also highly involved in the local and national startup community, winning several hackathons and entrepreneurship competitions. Her proudest accomplishments are in community building through her positions in the organizing committees of local meetups, Startup Weekend Ottawa and CanUX, Canada’s largest user experience conference. Aqeela hosted season one of Canadian Entrepreneurship Institute’s Startup Gov, the first live show about entrepreneurship and government by Startup Canada.